Moscow's Domodedovo Airport serves as the home hub of S7 Airlines: Qantas' Oneworld alliance partner in Russia and the country's largest domestic airline, so it's fitting to have high expectations of S7's flagship domestic business class lounge, which is also shared by some S7 passengers travelling internationally. After all, this is the go-to business class space for pointy-end passengers and elite frequent flyers jetting from the capital city of the world's largest country, so step inside as we show you what's on offer. Finding S7's lounge in Moscow is a little tricky, not only because the check-in agent didn't mention that there was a lounge or where it was located, but also because there's no lounge signage immediately after security screening. Fortunately, I knew I had lounge access and that a lounge was indeed available, courtesy of a quick search on the Oneworld website, but less experienced travellers could be left without, despite being eligible. Having no clue whether to turn left or right after the security checkpoint with gates in either direction, I looked out the nearby windows towards the tarmac and spotted a group of S7 aircraft over to the right – easy to see even in the snow, as they're lime green – and so ventured right, and eventually found the lounge along the concourse. As the terminal handles both domestic and international flights, this lounge is in the domestic departures area, but if you're flying S7 internationally, you can use this lounge before proceeding through passport control from the same airside area. After a quick scan of my S7 business class boarding pass – no issues gaining access on a ticket booked using Qantas Points – I was straight inside, where I found high ceilings, tarmac views, and a variety of places to sit. ... with most seats here being positioned around tables, to make dining (or working) easy. When it's the latter, passengers with lounge access can jump on a dedicated 'lounge bus' to their aircraft, although my flight used a typical aerobridge, so didn't get to experience that. Knowing ahead of time if you'll be taking a bus also helps with getting things like jackets ready, given Moscow regularly sees chills in the negative double digits, when you wouldn't want to be caught outside in the cold. 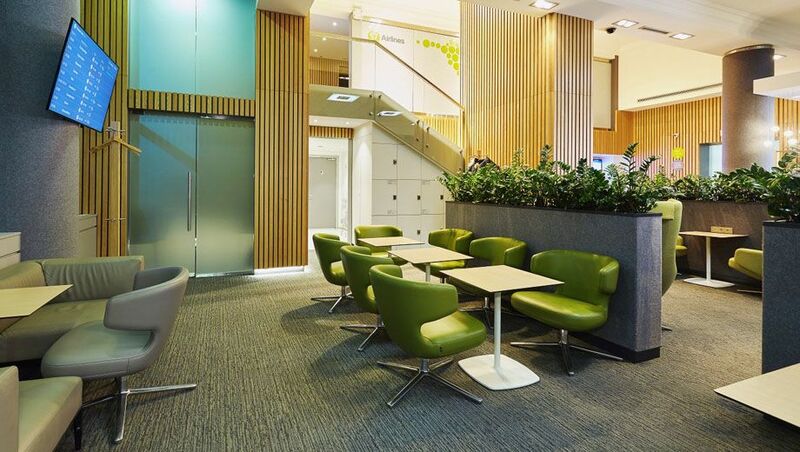 Note that passengers travelling on S7 Airlines' lower-cost Business Basic fares do not receive complimentary lounge access included as part of their fare. Access can either be purchased at the door or entry may be available via another method, such as through frequent flyer status or lounge membership as covered by the list above. That's also true if you find yourself aboard one of S7's all-economy flights, which is where the right frequent flyer card or lounge membership can come in handy: or as a last resort, your credit card to pay the lounge entry fee. On the dining front, there are two levels to the food and beverage experience here. While self-serve items are complimentary, orders placed at the cocktail bar, including food from a separate à la carte menu, are chargeable. First, here's a look at what's included with every visit, whether flying business class, accessing the lounge as a frequent flyer or lounge program member, or buying entry at the door, and that begins with the main buffet counter. ... "croissanwich" with salami, turkey on brioche, vegetable pizzetta, steamed vegetables, and baked potatoes. I tried bites of all the hot food but wasn't particularly fond of any of it, except for the pancakes – the breads were hard to the point of being almost inedible, the beef in the mini burger was tough, and the vegetables tasted like what you'd get in a frozen supermarket packet back home in Australia. ... although the options are all in Russian, so I hope you've done your homework, or can at least decide what you want from the pictures! Guests are also entitled to one complimentary bottle of beer per lounge visit, although I didn't indulge on this occasion. Given I wasn't too impressed with the buffet, I was hesitant to order food from the à la carte menu, but I'm glad I did, as 'chalk and cheese' would be an apt comparison. Having used Qantas Points to book my flight, that meant my pre-flight cocktail was actually more expensive than the journey itself – I'd paid a mere $14.25 in taxes, fees and charges for S7 Airlines business class from Moscow to St. Petersburg, plus 18,000 Qantas Points – which is still good value overall, and was good for a laugh. Payment is accepted by cash or credit card (Visa and Mastercard), but like most places in Russia, American Express isn't accepted here. There's also a proper barista coffee machine tucked away behind the bar, but being the airline's home hub business class lounge serving domestic and international passengers, charging ₽350 (A$7.50) for a latte – or anything at all, for that matter – is frankly ridiculous, despite the other (machine-made) coffee options available here. Many of the lounge's seats provide easy access to both European AC and USB power. ... and it was nice to have a tarmac view, towards S7's iconic lime green aircraft. While these could look out of place at an Australian airport, the green actually makes them easy to see in heavy (white) snow, which is something Russia gets plenty of. WiFi is also offered at the lounge, but I had no need to connect on this occasion – and generally avoid public WiFi networks in Russia at the best of times – so didn't test the speeds on offer. As luck would have it, that room was sitting open when I stopped by, so I poked my head inside, but found only more of the same tables and chairs as were everywhere else – so don't think this is even close to being the Russian equivalent of a Qantas Chairman's Lounge... more akin to a quiet room or family space. Overall, I'd arrived rather early for my S7 Airlines domestic flight, not knowing how long check-in and security would take and how big the airport was, but in the end, got to spend a couple of hours here before boarding, on what was a relatively quiet day. While the buffet food was far from impressive, I really enjoyed everything ordered from the menus, which also indicate how long each dish or drink takes to prepare: useful if you don't have a lot of time until boarding begins. The atmosphere here was also quite nice, particularly from my seat with a view towards the snow outside, but again, it's unfortunate that all alcohol is chargeable in such a flagship business class lounge: and to ask travellers to cough up for a barista-made latte just feels cheap, in what's otherwise a nice and refined space. Chris Chamberlin travelled at his own expense using frequent flyer points. ₽6,000 is a lot more than A$64! Thanks, 6,000 rubles was a typo as the AUD rate was correct (amended to 3,000 rubles). I'm heading to Moscow soon and am struggling to find currency exchanges/banks that deal with AUD. Do you have any suggestions if you used any? Cheers. Hi Daniel, can't help you there I'm afraid: I almost exclusively used credit cards – Visa and Mastercard are almost universally accepted (including with contactless: PIN required for 1,000 RUB or more), while AMEX is almost never accepted in Russia, except at major international hotels, Uber, and a few select restaurants. The only time I really needed cash was for the St. Petersburg metro (the one in Moscow accepts cards, though), and for tips, such as for housekeepers, drivers, porters etc., or at some restaurants that couldn't add the tip through the credit card terminal (some could, though). Even little market stalls had credit card machines, and I never encountered a credit card surcharge or minimum transaction amount the whole time I was in Russia: everybody just seemed happy to be making a sale. Hi Chris, I think you might have accidentally swapped the cities where you can use card to pay for public transport. I went to both cities last May and was able to use my PayPass/PayWave card directly at the gates in St. Petersburg metro, as well as on board the busses. Interestingly, on the bus it’s best to wait until the ticket officer comes to sell the ticket and then taps the debit/credit card on the reader for you. This is because the machine doesn’t issue a receipt and therefore there would be no way to prove that the fare was already paid for. In Moscow, i remember having to stop by the ticket machines before going through the gates at the station. Maybe the system in Moscow has been updated since, but St Petesrburg had it before Sydney! Hi vitorsyd, we're getting a bit off-topic now, but no, in Moscow I was able to use credit card at the ticket machines, but in St. Petersburg (at least at what was my local station), it was only possible to pay by notes of a specific value in return for a ride token. Didn't notice any card readers at the barrier, but then again, I wasn't looking for them. St Petes still had Soviet-era tokens last time I was there. Which was a while back. Daniel, there are money change offices everywhere, which generally give pretty similar rates for USD/EUR. They'll often post a rate for AUD but it may be pretty average. But I'd suggest you rely on your cards. Change a minimum into cash if you need. If you're really worried, pick up some EUR or USD before you go (I wouldn't be, having travelled to Moscow a lot). Some ATMs in Moscow will give you USD in cash if you want that. Having also flown S7 between DME - LED I found the general ambience in the DME lounge was nice, including the views outside and plenty of room But the food and staff were below average. Had to get the bongo bus between lounge and the aircraft at a remote stand which was a bit chilly, and no priority given to Business Class, although the product is Y+ at best. Also allow plenty of time in the Moscow traffic to get to the airport. As far as traffic to DME is concerned - I've done it to my office just near the Bolshoi in barely 45 minutes late at night - and 2+ hrs during the day in traffic. Comment on "S7 Airlines business class lounge, Moscow Domodedovo Airport"